This is our 28th year specializing in custom draperies! In this section, we have priced specific designs in certain fabrics ; but you can have draperies, shades, and cornices made of any fabric in the fabric section. If you would like to look further, we may suggest other fabrics or offer supplier websites for you to browse. 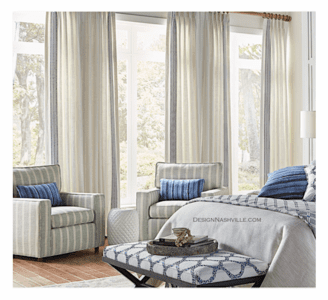 Email Design Nashville for courteous assistance with window treatments.